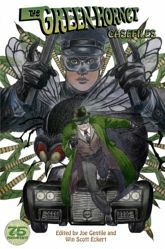 The Green Hornet & Kato - and their rolling arsenal the Black Beauty - are back again with all-new stories! This is the second anthology featuring all-new original crime fiction tales of the man who hunts the biggest of all game, public enemies that even the FBI can't reach! On police records, the Green Hornet is actually a wanted criminal, a master manipulator, a crime boss who has his fingers in every pie. In reality, The Green Hornet is actually Britt Reid, owner-publisher of the Daily Sentinel. Alongside him rides his partner Kato, who is not only a martial artist of unsurpassed prowess, but a skilled driver, and an educated engineer. Their goal is to destroy crime from within by posing as criminals themselves! 336 Pages. Black & White. Squarebound.